BRISTOL SHOW 2011: £10,000 of kit up for grabs in the show competition! | What Hi-Fi? BRISTOL SHOW 2011: £10,000 of kit up for grabs in the show competition! Join us at the Marriott Hotel this weekend and you could win one of our 16 fabulous prizes. 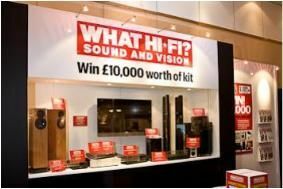 There'll be competition entry forms dotted all around the show, and we'll have them on the What Hi-Fi? Sound and Vision stand in the Bristol Suite too.